A growing part of the TRPS effort is to help poster artists and their families in time of need. Thanks to the efforts of noted Fillmore poster artist Dave Hunter, we are pleased to offer this beautiful 18 X 24 limited edition silkscreen print to honor the memory of one of the greats, Alton Kelley. All proceeds from the sale of this killer poster (every dime) will go directly to Kelley’s family through the TRPS Artist Relief Trust account. 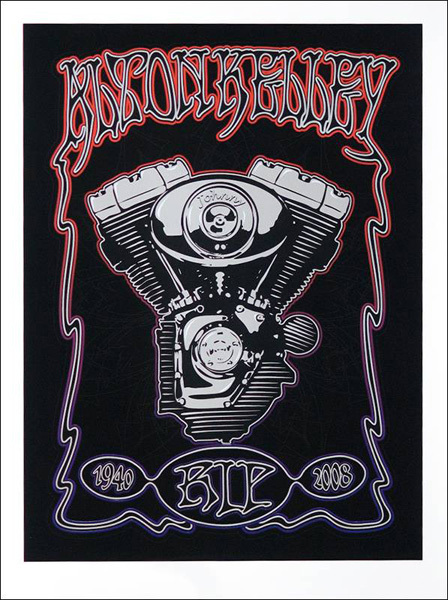 Printed in black, metallic silver, and colorful split fountain, the central image is a Harley-Davidson engine (Kelley loved his toys). The dripping psychedelic lettering would do Kelley proud. We unveiled this print at our Fort Mason show in San Francisco on June 14th, and these are the remaining copies from the show. Each is signed by the artist and numbered (out of a 100-copy print run). Please support this very worthwhile effort. Remaining quantities are limited, and when they’re gone, that’s it. This limited edition silkscreen is available now for a donation of $80 plus $10 shipping. If you want to include a message to Kelley’s family, we’ll be happy to forward it to Marguerite and the kids.